An innovative method has been developed by researchers to mount gold nanoparticles on a promising molecular support called polyoxometalate (POM). The team from Tokyo Metropolitan University has successfully applied this method to achieve almost 100% conversion of carbon monoxide (CO) gas over a broad temperature range, showing stable performance over extended periods of time. The researchers demonstrated how traces of water play a unique role in the function of a catalyst, providing a better understanding of catalysis and its potential uses in room air purification and exhaust gas. Gas purification happens to be a significant industrial process, whether in catalytic converters for vehicle exhausts, factories, or the domestic air purifier. Research has recently focused on utilizing nanometer-sized gold particles, which are known for their potential to accelerate ("catalyze") chemical reactions, even at extremely small (<5 nm) sizes. These usually have to be mounted on a solid "support." The research team, headed by Toru Murayama (Project Professor) and Masatake Haruta (Professor), has successfully integrated gold nanoparticles with POMs, a potential support material which has already been a subject of intense research in n material sciences, surface, medicine, and catalysis. So far, POMs and their salts, i.e., molecular ion species of metallic oxides, have not been extensively used for the stabilization of gold particles. Using a sol immobilization method, the researchers mounted gold particles down to a size of 2 nm and efficiently applied it to a low-temperature CO gas purifier. 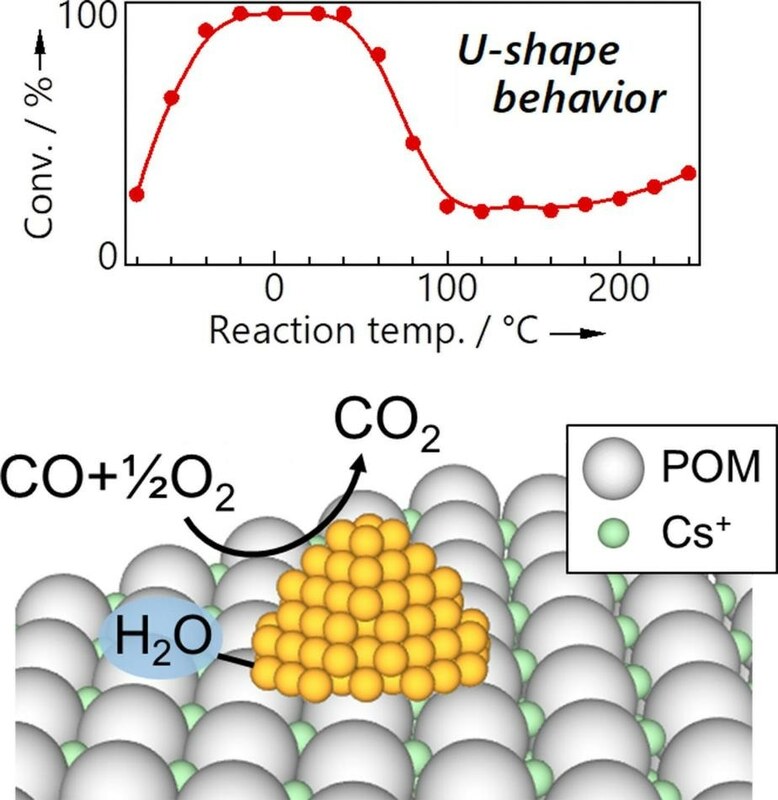 The novel gold-POM catalyst demonstrated efficient conversion at -50 °C, which is an exceptional performance even for a gold nanoparticle catalyst and also showed the stable and complete removal of one %vol concentration of CO over a period of 35 days at 0 °C, without material degradation. The team observed that better performance resulted from smaller particle sizes and that the material’s conversion efficiency exhibited a unique reliance on temperature. This eventually led to the findings that trace amounts of water were very important for the material’s function. This was the first novel mechanism suggested for catalysis in POM/gold catalysts. Both the method and the newly discovered mechanism could provide a deeper insight into catalysis, and also show its potential uses in industrial filtration, for both liquids and gases. The "Nanotechnology Platform" Program of the Ministry of Education, Culture, Sports, Science and Technology (MEXT), Japan supported the study. The manuscript reporting this finding has been published online in Angewandte Chemie, International Edition.